Ah, the ebb and flow of online movie reviewing! As anyone who enjoys writing as a hobby (or, if they're lucky enough, does it for a living) knows, inspiration can be a fickle thing. And if you do write in your free time but don't get paid for it, it can be doubly hard to put off the necessities of life (bill paying, holidays, general hygiene, etc.) in order to, say, type out a pithy little indictment/praise of someone else's attempt at art. Throw in the x-factor of trying to synchronize said whimsical composition with a like-minded online individual, and we've got a recipe for procrastination of monumental proportions. The bottom line is, I would like to apologize to Brian Morton, Owner, Operator, and Proud Proprietor of The Bad Movie Guy website. You see, back in March of 2006, I contacted Brian with the idea of teaming up for a review. We had talked about our shared love of bad movies and good cigars over at the Rogue Reviewers Fan Club, so I thought, "Hey! Why not do a movie/cigar exchange!" That way we could enjoy the best and worst (of the best kind of bad movies) of both worlds! Fantastic! So we exchange addresses, and with great excitement, mailed off our respective little half evil, half delightful care packages, which we both tore into excitedly upon arrival. I had sent to Brian a truly horrific made for TV movie called "The Brain Machine" (starring none other than "Roscoe P. Coltrane"!) and one of my personal favorites, a Flor de Llaneza made by El Rey del Mundo. And you can read about Brian's take on these b-movie/cigar delights right HERE. So while Brian was able to post his review within the normal amount of time it would take a grown person to do so, I languished. In fact, I was overcome with such a horrific dual case of writer's block coupled with 'everyday life', that from March 2006 until January of this very year, I was only able to post ONE review (which was, ironically enough, another team up I had written long ago with another Rogue Reviewer, Jordan Garren of B-Movie Film Vault fame, for the sci-fi stinker, Robot Jox. In this case, both Jordan and I were overcome with the joys of living/severe lack of up-date-itis). So, to make a long story only slightly longer, I finally got my act together and wrote up a review. Made it just under the ONE YEAR mark! Alright! Anyways, Brian had sent me a fantastic ONE-TWO punch of goodness and badness in the form of a Romeo y Julieta Special '007' edition torpedo along with the Eric Roberts' starring classic, Best of the Best! I probably could have used another year to prepare for this one. Everything about this film is the basest of base elements. The script literally could have been 15 pages long. As a matter of fact, that's being too generous. I'm going to write out the "Best of the Best" script for you right here, in less than a page. Enjoy. Meet Alex Grady (Eric Roberts). He lives with his mother and his son. Wife's dead. Alex used to compete in karate, but suffered a serious shoulder injury. He misses competing. Insert crying scene with mom and Alex regarding how much he wishes he could compete. Then send him invite to national karate tryouts. Meet Tommy Lee (Phillip Rhee). Tommy has his own Tae-Kwon Do gym. He gets invited to national karate tryouts. We're at the tryouts where we meet Travis (Chris Penn), Virgil (John Dye), and Sonny (David Agresta). They'll be making the team along with Alex and Tommy. Travis is a racist cowboy hick, Virgil is a Buddhist, and Sonny is Italian. We know this because Travis wears a cowboy hat, Virgil sits indian-style and stares blankly into space, and Sonny says, "I'm Italian!" (He literally says this. Not figuratively. The words "I'm Italian!" actually should come out of his mouth). Meet the coaches, Coach Couzo (James Earl Jones), Don (Tom Everrett), and Wade (Sally Kirkland). Couzo yells, Don's a computer nerd, and Wade is a woman who may or may not know something about Eastern philosophy and meditation. The important thing is, she's a woman, and Coach Couzo doesn't want a woman on his staff. Meet the Korean team. They're evil. Especially the one with an eye patch. He's SUPER evil. You know what? He may have even killed Tommy's brother. In fact, have Tommy say, "He killed my brother!" And tell him he can't laugh when he says it. Training montages. Lots of them. Big Fight Finale. Sonny, Virgil, and Travis all get their butts kicked. Alex should injure his shoulder during his match but should still win. Have a Mister Miyagi-type of injury healing moment here. But with lots more screaming and snot bubble blowing from Alex. Matter of fact, have Alex pull a Daniel LaRussa and finish off his guy with a kick to the face. Have his fresh out of a coma kid there in Korea to cheer him on. Then have Tommy fight evil patch-wearing guy who "killed his brother!" Back and forth. Very choreographed. Then have Tommy almost kill Eye-patchy McEvil Korean, but have him showing mercy. Then wrap it up with everyone crying and snot bubbles all around. I don't know if I've ever seen a movie more reliant on the viewer's sense of memory before. It's almost like "method movie viewing", making you recall better movies in order to complete the poignancy of their own scenes. "Best of the Best" gives you just an inkling, the roughest of rough sketches of a particular scene and then basically says, "Hey, remember how good that scene from 'Rocky' was? Or that one from 'Bloodsport'? Or 'The Karate Kid'? Wasn't that cool? Well imagine we did that here." Every scene is a re-creation of something we've seen done better somewhere else, and every line sounds like an ad-lib. Yet they stretched it out to just over an hour and half. How? Training montages. Lots of them. We get no less than THREE training montages. And they're broken up with some training footage with dialogue in it. But the bulk of our running time is filled out with sweaty, trembling, screaming training montages. It's amazing really. It took some guts to do. The remaining time is spent with our 2 leads, Phillip Rhee and Eric Roberts. Rhee isn't really asked to do much. He's obviously here for his martial arts ability, which he shows off amply. Eric Roberts is here to chew every piece of scenery he can get his hands on. I've seen Mr. Roberts in a number of movies, some that I've even enjoyed ('Runaway Train' jumps immediately to mind). But no matter what I've felt about the films, I've always noticed this bizarre quality about the delivery of his lines. When he emotes, it almost sounds like he doesn't want his tongue to touch the insides of his mouth. That's the best way I can describe. It's not a swollen tongue, because he's able to annunciate every word. It's more like his teeth are hot, and he doesn't want to burn his tongue on them. So everything he says has this very breathy, vowel-y quality to it. When he's screaming "Tommy! No! Coach! Coach! He's gonna kill him!" during the finale, all I heard was "A, E, I, O, U, Tommy! And sometimes Y, Coach! Sometimes Y!!" This coupled with his propensity for the hysterical makes him someone truly mesmerizing to watch. Unfortunately, it's about the only mesmerizing aspect of this film. Okay, uh... Phillip Rhee is good. Okay? And everything else is bad. Okay... maybe that's not totally fair. Obviously the other fighters on Team USA had some degree of martial arts training. Eric Roberts seems to know some moves, and his pre-fight stance is something I've seen copied since. Sonny and Virgil are able to get their kicks nice and high. But the suspension of disbelief begins to strain a bit when we come to Chris Penn's Travis. I love Chris Penn. I was really sad to hear of his passing. (get ready for the 2x4....) But I really have a hard time believing his character here was amongst "The Best of the Best" that our country has to offer in the way of martial arts. Country Line Dancing? Maybe. Competitive Eating? Certainly. But one of the top 5 martial artists in the U.S.? Highly doubtful. Next we have the eternally long training montages. On the U.S. side we mostly have dimly lit, oiled up shots of Rhee and Roberts doing dips and hitting the heavy bag. We also get some totally unlikely headgear-less, full-contact sparring. And maybe you can answer this for me... why does full contact sparring yield nary a scratch, but once the American team starts the competition, they immediately look like they've been bobbing for apples in a barrel of grape jelly? Seriously, they all look like absolute hell after their matches with the Koreans. And we also get a lot of James Earl Jones yelling. A lot. Like, more than necessary. I only caught James Earl looking embarrassed in a couple of scenes. More often than not it was during one of Eric Roberts' many prolonged screaming, snot-bubbling fits, so that can be excused. And in Korea we have even more yelling. Un-sub-titled yelling, so it seems all the more sinister. Just a foreign voice yelling, assumedly, foreign platitudes at the five Korean fighters. One image in particular sticks in my mind: one of the entire Korean team running in knee-deep snow. I'm sure it was supposed to look very tough; man against nature and all. But let's just say the actors didn't really "sell it". They all looked miserable and maybe a little bit drunk. Not at all like the paragons of health, balance, and purpose that they were supposed to be. I don't even want to get into the issues that a person wearing an eye patch would have in hand-to-hand combat. And the cherry on the training montage sundae? Sally Kirkland karate-chopping a dozen concrete slabs in half. Yeah. It was.... strange. "A terrific looking natural brown wrapper catches the eye, as does the classic torpedo shape. An even draw and burn yields a fantastic medium-bodied taste, with hints of cedar and coffee and, call me nuts, even a bit of mint. Solid construction, something I've come to expect from the Romeo y Julieta brand. A top-class cigar from start to finish!" First, I'd like to once again apologize to Brian for my tardiness in posting this review. I certainly hope it doesn't deter him from taking part in more "Smoke and A Flick" exchanges with The KO Picture Show. I'd also like to thank him for the fantastic cigar. 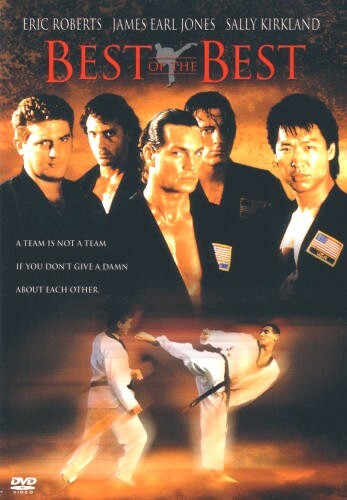 And I only wish he was here with me in Jersey to share in the joy that is Eric Roberts earning his Ham-is Emeritus badge in "The Best of the Best". His scenery chewing was the only thing that made this movie even watchable.